With the unemployment rate at a record low, now is statistically the easiest time to find a job in NZ since 2008. If you’re an employer looking to hire, this is not great news. With vacancies in most industries surging, attracting candidates with the right skills to your business is going to become harder for most firms, than finding a black cat in a coal cellar. Big Splash are passionate about ROI and helping our clients to understand which media is working for them. After all, that's what we do. 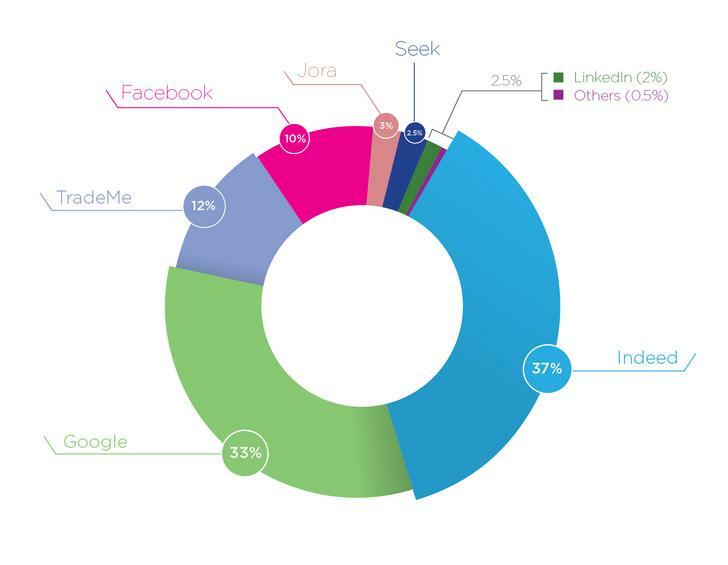 We've crunched the data from over 1 million job seeker visits to our clients' online application portals in 2017 to bring you an overview of the NZ recruitment advertising landscape. In 2017, the most significant move on our 2016 results was seen in Facebook and Google, now driving 43% of our more than 1 million job seeker visits to a job application form. That's why we say that just placing an ad on a job board and waiting for applicants to flood your inbox is a risky recruitment strategy. Don’t assume you have to advertise your opportunity in a ‘job seeking environment’. Considering the online behaviour of your ideal candidate holistically, as this will help you reach them where they live, work and play. A clever algorithm, combined with significant investment in SEO saw global giant Indeed continue to dominate the candidate traffic source stats in almost all industries, delivering 33% of traffic. Indeed operates like a search engine and is continually evolving to improve the candidate experience. If you are a talented content writer and can create a great recruitment ad that’s packed with key words, more power to you. If not, Indeed still delivers. With over 50% of candidates now starting their job search at Google, and Indeed growing in popularity, knowing how to apply key words to your recruitment adverts is important. Not only does it help you get found, great writing increases the likelihood that candidates will choose to apply to your ad and not your competitor’s. If all this is a bit overwhelming, reach out to Big Splash. We’ll be happy to help. * Data based on traffic to our Group clients’ online job application portals. Over 1 million sessions in 2017. Direct traffic and applications received via email are not included. © Copyright Big Splash Pty Ltd.